Breaking News: Sailor Moon Animators and Artemis to Appear at Otakon! We thought that Animazement was at the top of our list for cons we wish we could attend but couldn’t, and yesterday we found out news from another one that topped that! Baltimore’s Otakon is going to host three important people involved with Sailor Moon in Japan! Kappei Yamaguchi (Artemis in PGSM) will be appearing at the convention. So far he is the only Seiyuu on their guest list. The other two are the husband and wife team of Hiromi Matsushita and Kazuko Tadano! Kazuko worked on character design and animation directing in Sailor Moon and Sailor Moon R seasons, and for the Sailor Moon R movie. She based her work on Naoko Takeuchi’s original manga. Hiromi directed the first episode ever of Sailor Moon, and set the tone for the entire series. He also worked key animation for the Sailor Moon R movie. Both of them also worked on the 21st episode of the series (the 17th one for those keeping track with the dub) where Ami/Amy visited an animation studio. The two made an interesting cameo as the two female students at the center of the plot! 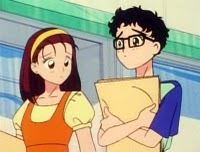 In the Japanese version, they were named Kazuko and Hiromi (Hiromi was the student that Nephrite targeted). Dubbies are familiar with them as Cassie and Lori, respectively. Unfortunately, no pictures of either exist on the internet, so we have provided you with a screenshot of their cameo characters from the show. We’re sure at least a few of our readers will be attending this con, and we would love to hear from you about what went on when these three took the stage!